Did you know that your attire and accessories can actually mar your game? If you have been getting scores that are disheartening probably it’s time to check your gear which incidentally includes your golf socks. Come to think of it, it is only fair that your feet are protected and well-taken care off because they bear the burden of your actions. ​A good pair of socks will give you the perfect grip and support. No; not all socks are made the same. There are some special qualities the best golf socks have that you must know about. Now, now don’t let those worry lines crease your forehead; you are here for a reason and we will not disappoint you. We have done the laborious work of sifting through several brands and have narrowed down the list to five of the best golf socks that every aspiring golfer should possess to play comfortably and with ease. Choose socks that will protect your ankle from scuffing from your shoes. If you are troubled with painful blisters and hot spots despite wearing the so-called best socks you should try the Swiftwick range of socks. Manufactured from some of the finest materials and using the best technology these socks are durable, comfortable and lovable. Swiftwick is a name to reckon with in the industry; they use 200 needle knitting process to produce some of the best contoured and tight-fitting socks essential for all endurance sports. 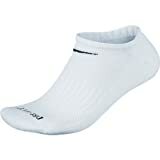 The typical problems you associate with socks like that of bunching, an improper fitting which lets debris enter, insufficient padding (if you are a runner or on your feet for long periods of time) which leads to blisters is absent in this model. The Aspire zero is a “No Show” socks which means that it is not visible above your ankle. You can wear them not only for sports but also in your loafers and no one would be wiser. Their compression feature is specially designed to support runners, cyclists, and golfers who are on their feet for extended periods of time. Though the fit is tight it doesn’t squeeze the bunion area; this reduces friction and scope for blister formation. The Aspire zero is an all-rounder – it provides arch support, gives medium compression and sufficient cushioning for the feet. It is manufactured from a combination of Nylon, Repreve, Olefin, and Spandex; as a result, it absorbs the sweat but also dries fast and doesn’t lose shape. It remains unaffected by chemicals in detergents. Unlike the routine compression socks which are very uncomfortable, the medium compression in this pair is comfortable and bearable. There is not enough padding. A whole day out in the sun can be disastrous for your socked feet; they will feel sore, blistery and smelly if your socks don’t do their job well. The regular cotton socks do absorb moisture but the wetness does not evaporate. So those with extra sweaty feet need something like the Nike Golf Dri Fit socks, a polyester blend, which incidentally is one of the best golf socks in the market. The pair is made of 50% polyester, 45% cotton,3% nylon and 2% spandex; a good blend of all the beneficial elements in each of this material – absorbs moisture, dries quickly, stretches sufficiently also increasing the durability. The mesh panel on top further improves the breathability adding to the comfort factor. As the name suggests this pair will keep your feet cool and dry. You need not worry about being affronted with blistery, smelly feet at the end of a day’s play. Lined with Gore-Tex these feet will ensure that you are never wet and uncomfortable. The first areas to show signs of stress are the ball region and the arch. The ribbed cuff provides a snug fit that is comfortable and keeps the socks in place. There is extra padding in the usual areas prone to more wear and tear like the heels and toes. This cushioning also protects against impact injuries. Long stretches of walking on rough terrain on the golf course coupled with standing often add immense stress to the arch and result in golfer’s heel or arch pain. The Nike Dri fit has a compression arch design which provides the much-needed support to your arches. This easy to maintain machine washable socks are suitable for golfers and runners. But a drawback is that this pair does not have any right and left specifications. A brand that produces quality products. Some users had issues with the sizing. As already mentioned before your golf socks must be supportive and comfortable. One of the most common problems with socks is the stench. After a full day, it becomes embarrassing to remove your socks in front of others but this Under Armour heat gear socks is designed to prevent odor forming bacteria from growing in these socks. The Under Armour crew socks are manufactured using a nice combination of polyester, cotton, nylon, and spandex. This blended material has the ability to absorb your perspiration immediately and also drying before the wetness becomes uncomfortable. Foot fatigue is a common cause that many golfers have to face. The Under Armour pair is embedded with arch support to reduce any foot problems that might arise from long hours of standing and walking. The special features unique to this pair is the seamless toe design which prevents painful blisters from forming on your toes. The contoured Y heel provides a snug and comfortable fit and ensures that the sock stays in place. These socks have an anti-slip design which provides good traction in the shoes. Not all golf socks are meant for all temperatures and climate. This heat gear crew socks will keep your feet cool in temperatures ranging from 75 degrees and above. The same brand manufactures other socks suited for winters and to wear all year round. The one glaring drawback in this crew socks is the tight elastic which leaves the calves sore. There are also issues with the cushioning failing at times. The socks retain their shape even after several washes. The socks are too warm and thick. Golf is a game where you are on your feet for long periods of time, walking from fairway to tee or rough. This leads to blisters on the feet, pain in the foot and several other inconveniences. To overcome such hardships, you require a good pair of socks that can be supportive, comfortable and easy on foot. Kentwool has brought out the Men’s gameday socks which are perfect for those long days. Made in the USA the Kentwood socks come with a lifetime blister free guarantee. This expensive pair is manufactured using the Cocona polyester a material which uses activated carbon formed from coconut shells. This product increases the surface area of the material which leads to better absorption of sweat and at the same time also improving the rate of evaporation leaving and a dry and comfortable feeling behind. The other materials used are merino wool, spandex, and nylon. Merino wool also has a part in improving the comfort factor; they keep your feet cool even on scorching days. The plaiting spandex plays a vital role in maintaining the shape of the socks while fitting the contours of your feet perfectly. And finally, nylon vent on top increases the breathability of the socks, an essential feature of any good pair of golf socks. These socks also ensure that your feet remain free of annoying odor and the related bacterial growth. Kentwood socks are easy not only to wear but also to maintain and wash because of the high quality of construction, design, and materials used. The socks, as a result, are more durable than most of the other brands. The moisture wicking nature of the socks quite naturally keeps hotspots and blisters away. To enhance the comfort factor the socks are adequately padded just enough to be comfortable. If you are searching for an economical pair of cotton socks that are sufficiently stretchable and easy to wear try the PACKGOUT toe socks. Though cotton is not the most preferred material for sports socks, there are a few exceptions like the PACKGOUT toe socks. Featuring a unique blend of cotton and Dacron, PACKGOUT has produced a winner. High-grade cotton is blended with Dacron to improve the stretch ability and to maintain the dryness. Not everyone can wear socks made with synthetic, polyester or wool. For such people with allergic tendency, these toe socks are the best. What is special about this pair is the No heel design which facilitates all shapes and sizes of feet to wear this socks comfortably; it will be perfect and snug fit each time. Furthermore, you will save time spent on identifying the right and left in a pair. This pair of toe socks is ideal for runners because it allows the individual to learn to push off properly. With each toe individually draped you will experience better feedback during movement which allows you rectify any faults and improve your overall performance. The socks fit comfortably to each toe and reduce the friction between toes. This, in turn, makes sure that there are no painful blisters that you have to deal with. These socks also reduce the friction between the socks and the other fingers. Do not assume that just because the socks are predominantly cotton you will have to deal with wetness and odor. These socks don’t smell. They are not only ideal for running, hiking, mountaineering but also for gold where your feet carry your weight for extended periods of time. The individual draping between the toes minimizes the occurrence of blisters. These socks also facilitate push-off, a feature which is supposed to enhance the speed and stride for runners and walkers. As a golfer, it might be beneficial for you if you have to walk long stretches on the golf course. They can be worn for practically anywhere. The socks can be machine washed and they retain their shape and size. There is no evident shrinkage commonly seen in cotton socks. What makes them even more endearing is the price tag. The makers are so confident about their product that they offer 30 days free return if you are not satisfied with their product. The socks are also covered with a one-year warranty. However, not all is hunky dory with this pair. There are several dissatisfied customers out there who have issues with the size of the individual toes. Many have found them to be too small for their toes. Our feet bear the burden of our entire body weight every time you are standing or involved in any kind of sports bar swimming. Hence, when they don’t get proper support they protest and you end up with painful blisters, calluses, and other rough spots. A good pair of socks can alleviate your suffering to a large extent and in fact contribute to better performance in whichever sport you indulge in. Are Golf socks different? Yes, a good pair of golf socks must be able to have good wicking abilities. They should be able to keep your feet warm in cold climes and cool and dry in hot humid weather. The material should be able to absorb perspiration immediately and dry up simultaneously. The latest technology used in manufacturing gold socks ensures that your feet remain dry all the times. Another reason your socks should be specifically made for golf is because when you swing your body weight shifts on the feet necessitating your socks to provide adequate support to prevent foot and ankle injuries. In case, you don’t know how to choose the best golf socks, read this buying guide which will educate you. There are certain basic elements that need to be considered while buying golf socks. Cotton – It is a great absorber of moisture but not the most suitable for sports as it tends to get heavy with perspiration and deters your performance. Ideally, you should look for a cotton blend which will use the best qualities of both materials and ensure the moisture is absorbed but your feet still remain dry and at ease. The advantage in cotton is that it is not expensive and is comfortable but is not recommended for an intense activity where you sweat more. Merion Wool – Probably the most popular material for socks for its durability, softness, no-itch and cushiony feeling. This material is also known to be resistant to odors and shrinkage. Its breathable nature makes it a huge favorite among all active people. The ability of wool to absorb water which is almost 30% of its weight makes it suitable for sports socks, as it ensures dry feet even after intense exercise. Do not confuse it with the rag wool which itches from the time you wear it. The two drawbacks to this material are that it is expensive when compared with other materials and does not dry as fast as synthetics. Nylon – On its own, you can’t use it because of its slippery and itch producing nature but it is successfully blended with other material to produce a durable and enduring sock that is comfortable to use. Nylon socks are durable, cushion well and dry fast but they are not ideal for hot and humid climates. Therefore, choose nylon blended socks more suited for such places. Spandex – Every individual’s feet are unique and hence most of the socks fall in the common bracket size. This leads to poor ill fitting and uncomfortable material on your feet which will result in all kinds of problems. But to make the sock fit snugly you need a stretch provided by spandex. Ideally, it should comprise only 2-5% of the material. Ingeo: A relatively new and less in vogue material manufactured using corn based polylactic acid fiber. This eco-friendly fabric can be easily recycled. It controls odors and absorbs moisture like polyester. The only drawback is that it has to be commercially composted and is not very durable. Acrylic- The next best choice after Merino wool is acrylic which is easy maintenance, provides decent cushioning and most importantly dries fast. No show – These socks end just below the ankle and are not visible above the shoe. Are they comfortable? Yes and no; unless you are wearing a well-constructed sock with good grip, these socks tend to slip. But a good pair is comfortable and cool. Ankle length – This is the conventional length of most of the golf socks. They are the most preferred form as they end just above the ankle and provide a feeling of complete protection to the feet. Most runners and bikers use them. Crew length – Another mid-calf length sock they provide support to the arch and the ankle as well. You can use them for backpacking and hiking. Sock size: It is mandatory that you wear the right size socks to prevent squeezing of your toes. There should be no extra material in the shoe and the sock should fit snugly around the arch and the heel. The size of the socks is related to the shoe size. Always go through the size chart provided by the manufacturer to determine the right size for you. Too long socks bunch near the toes and if small in size they won't stay at the ankle but trickle down to the foot making it very uncomfortable. Thickness: The more the thickness the more the cushioning effect; of course, the thicker material also tends to be warm. So, the climate also matters; ideally, medium thickness should do for most cases unless you have specific foot issues. Anti-blister – material like cotton retain the moisture within and this often leads to blisters. Opt for material that has quicker drying ability thereby not allowing blisters to form. Individual toe style – Do you want a slot for every toe or do you prefer wearing the standard design where are toes are close. This is based mor e on comfort than anything else. Ankle support – here the material used is specifically designed to provide more support and elasticity. Arch support – It is quite common for golfers to develop pain in the arch of their foot or even plantar fasciitis leading to severe pain the heels and especially in the morning on getting up. Therefore, look for socks that reinforce the arch and provide more support irrespective of your foot type – high arched, flat footed or normal. Of course, your foot wear should supply the adequate support. The elastic material is used to provide more support in this region. Those with arch issues should most certainly opt for these. Design: Looks do matter especially on the golf course. Ensure that your socks match your shoes and your attire- you don’t want to rattle the fellow golfers with your fashion sense right! ​Golf is a game that requires a lot of skill and mental strategy. You can focus completely only when your attire which includes the shoes and the socks is comfortable and irritation free. It is therefore essential that you pay heed to the kind of socks you wear during a game. Take time to know your feet and then choose a sock that fits best so that it is only your swing, tee, and drive that worries you and not a pair of sweaty, slippery and itchy socks!